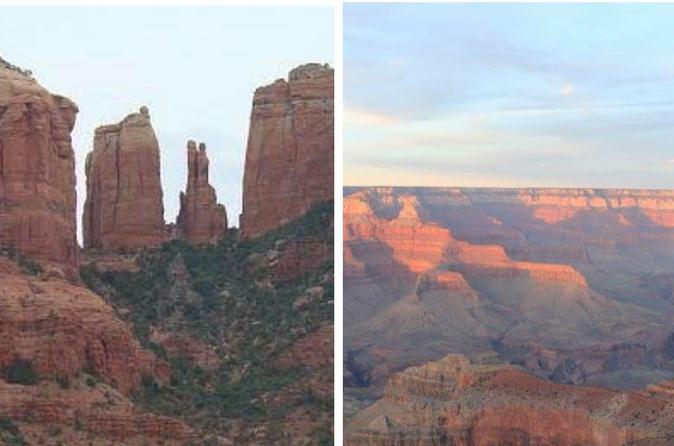 This 13 to 14 hour tour takes you to BOTH Sedona and the Grand Canyon. See Sedona and the Grand Canyon via a small group of up to five passengers maximum. This small group tour gives you a more personal and comfortable experience as you make your way through the red rocks of Sedona to the grandeur of the Grand Canyon. In Sedona, you will visit Bell Rock Vista for photos, the Chapel of the Holy Cross and a bit of time in Uptown Sedona for some unique shops and more scenery. Then on to the Grand Canyon National Park for about a 3 hour visit including 2 unique views of the Canyon at a minimum. Enjoy just the right amount of narration and quiet time to take in the scenery and history as you travel to the Grand Canyon via Sedona. In Sedona, enjoy a visit to Bell Rock Vista for photos, 30 minutes to explore the Chapel of the Holy Cross and about 1 hour in Uptown Sedona for unique shops, galleries and more scenery. Your expert guide will take you from Sedona through Oak Creek Canyon and on to the Grand Canyon for about a 3-hour visit, making sure you get the best views that the park has to offer. Some incredible overlooks can be seen from Grand Canyon Village and Yavapai Point. Admission to the National Park is included as well as bottled water and soft drinks. Meals and gratuity are not included. Dining and route options can be discussed at confirmation.There is a certain amount a flexibility with our small group tours, depending on your group size and our schedule.